BACKGROUND AND PURPOSE: Few reports have described the embolization of head and neck lesions by using direct percutaneous techniques. We report our preliminary experience in the direct percutaneous embolization of hypervascular head and neck tumors by using Onyx in conjunction with standard endovascular embolization techniques. We describe the technical aspects of the procedure and its efficacy in reducing intraoperative blood loss. MATERIALS AND METHODS: We retrospectively studied 14 patients (3 females and 11 males; mean age, 33.4 years; range, 11–56 years) with 15 hypervascular tumors of the head and neck that underwent direct percutaneous embolization with Onyx in conjunction with particulate embolization. Nine paragangliomas and 6 JNAs underwent treatment. Documented blood loss was obtained from operative reports in these 15 patients with surgical resection performed 24–48 hours after the embolization. RESULTS: Intratumoral penetration with progressive blood flow stasis was achieved during each injection. A mean of 3.1 needles (20-gauge, 3.5-inch spinal needle) were placed percutaneously into the lesion (range, 1–6). The mean intraoperative blood loss was 780 mL (range, <50–2200 mL). Near total angiographic devascularization was achieved in 13 of 15 tumors. There were no local complications or neurologic deficits from the percutaneous access or embolization of these hypervascular tumors. CONCLUSIONS: In this study, the use of percutaneous injected Onyx in conjunction with standard endovascular embolization techniques in patients with hypervascular head and neck tumors seemed to enhance the ability to devascularize these tumors before operative removal. 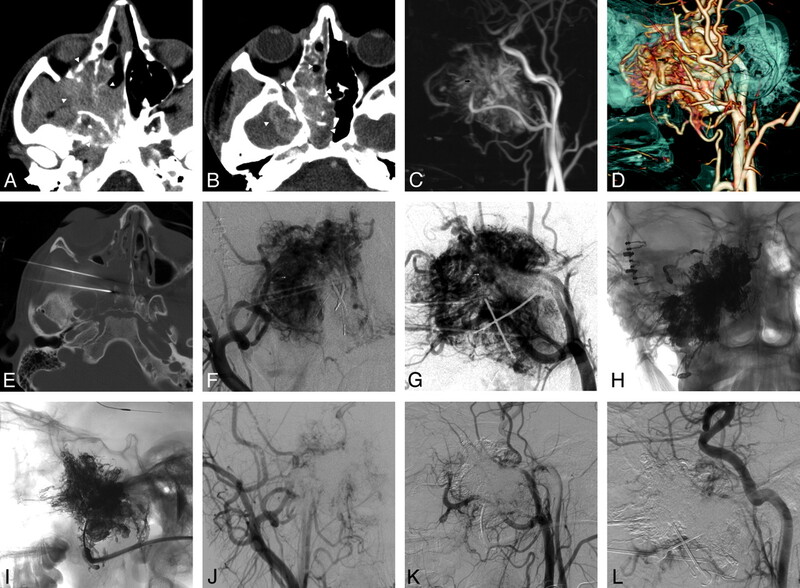 Transarterial embolization of hypervascular lesions of the head and neck is an established technique to devascularize lesions for curative, preoperative, or palliative management. Preoperative transarterial embolization reduces intraoperative blood loss, shortens surgical time, and reduces morbidity and mortality.1,2 Depending on the angioarchitecture of the lesion, embolization can be performed with a variety of embolic materials, including coils, particles, or liquid embolic agents. The value of particulate material for embolization of hypervascular lesions in the head and neck is well documented in the literature.3,4 However, endovascular embolization may be limited due to vessel tortuosity, vasospasm, atherosclerotic disease, or very small arterial feeders. Few reports have described the embolization of hypervascular head and neck lesions by using a direct percutaneous technique with EVOH (Onyx; ev3, Irvine, California).5,6 We report our preliminary experience in the DPE of hypervascular head and neck tumors by using a liquid embolic agent, EVOH, in conjunction with standard embolization techniques. We describe the technical aspects of the procedure and its efficacy in reducing intraoperative blood loss. We obtained approval from the institutional review board of our hospital for a review and utilization of patient medical and imaging records. Case records consisting of diagnostic imaging studies and reports, neurointerventional imaging studies, operative reports, clinic notes, and hospital charts from the last 2 years were retrospectively reviewed for the last 15 consecutive patients referred to the interventional neuroradiology service for therapeutic devascularization of hypervascular tumors of the head and neck in which DPE EVOH was utilized. Nine paraganglioms and 6 JNAs were treated. Patients undergoing therapeutic embolization by endovascular and/or DPE techniques received general anesthesia with monitoring of the patients' EEG, visual evoke potentials, and somatosensory-evoked potentials. Standard percutaneous transfemoral arterial access was obtained in all patients at least once to identify the arterial supply and hypervascularity of the lesion. Diagnostic cerebral angiography was performed by selective catheterization and injection of nonionic contrast lodixanol (Visipaque 270; GE Healthcare, Princeton, New Jersey). Depending on the anatomic location of the tumor, the following craniocervical arteries were injected: internal carotid, external carotid, vertebral, subclavian, costocervical, and thyrocervical. The results of the diagnostic angiogram were used to assess the feasibility of endovascular or DPE, to establish the arterial blood supply to the tumor, to evaluate for dangerous collaterals to the intracranial circulation, and to determine the appropriate projection required to monitor the embolization. Superselective catheterization of the feeding artery was performed followed by selective DSA to look for dangerous collaterals and confirm appropriate position of the microcatheter. If the arteries feeding the tumor also gave off branches supplying the normal tissue, such branches were proximally occluded with microcoils. Embolization was then performed with tri-acryl beads 100–300 μm suspended in iohexol (Omnipaque 300; GE Healthcare). These were injected through a 1-mL syringe under a constant negative roadmap until complete stasis of flow within each feeding pedicle was achieved. If there was significant arterial venous shunting within the tumor, the particles were increased to 300–500 μm. The proximal main feeding artery was then occluded with detachable platinum coils. Successful embolization was determined by failure to opacify the vascular territory of the embolized vessel on a subsequent angiogram. If superselective catheterization of the feeding artery was not possible due to its small size, or there was the possibility of reflux into a dangerous intracranial anastomosis, or there was persistent filling of the lesion after endovascular embolization, DPE of the lesion was performed. A detailed angiographic evaluation of the tumor was initially performed to delineate the targeted neovasculature of the lesion and to select the ideal projection to monitor the embolization. Lesions were punctured with a 20-gauge needle under sonography or fluoroscopic guidance. Lesions at the level of the skull base or deeper within the face or neck were targeted by CT guidance under general anesthesia. This was done to avoid puncture of the carotid artery, salivary glands, jugular vein, bone, and other important structures in the head and neck. To allow direct puncture of the skull base lesions (JNA and glomus jugulare tumor), infrazygomatic, transnasal, transpalatal, or transoral approaches were often used. The patients were then transported to the angiography suite. After puncture, the needle position was considered correct when blood reflux from the needle was slow but continuous. A gentle hand injection of iohexol was then performed through the needle and a biplane parenchymogram was obtained. This was utilized to confirm placement of the needle within the lesion, to assess the neovascular compartment of the lesion being filled by the needle position, and to determine the venous drainage pattern and opacification of possible arterial feeding pedicles. We chose EVOH as our liquid embolic agent in view of its favorable properties of decreased fragmentation, ability to be injected slowly over longer periods of time (compared with n-BCA glue), and its decreased tendency to occlude the needle quickly. The technique consisted of initially priming the dead space of the needle with DSMO and then injecting Onyx 18 (6% EVOH) or Onyx 34 (8% EVOH) slowly through the needle with a 1-mL luer lock DMSO-compatible syringe and connecting tube under continuous negative roadmap. The EVOH was injected in a very controlled manner utilizing the tap technique, which consisted of making small taps on the end of the leur lock syringe with the operator's thumb, injecting at a rate of ∼0.1–0.2 mL/min. If the material appeared to enter a vein or an arterial pedicle, we stopped the injection and then waited ∼2 minutes. This was repeated until the EVOH was able to penetrate the desired segment of the tumor. The duration of each injection varied from 10 minutes to 90 minutes depending on the manner in which the EVOH filled the vascular bed of the lesion. The injection was stopped if there was significant filling of an arterial pedicle retrograde, venous outflow vessel, or dangerous ECA/ICA or ECA/VA anastomoses. An angiogram was performed to determine the extent of devascularization and to target the next neovascular compartment. This technique was repeated as many times as necessary to achieve optimal devascularization of the tumor. The technical success of the embolization procedures was determined by the degree of residual parenchymal staining of the tumors on biplane angiography. The extent of tumor devascularization was graded accordingly: poor (0%–30%), moderate (30%–70%), subtotal (70%–90%), near total (90%–99%), and total (100%). A 14-year-old boy presented with a large JNA with intracranial extension (Fig 1A, -B). The patient was symptomatic with recurrent nosebleeds and nasal stuffiness. Initially CTA was performed by injecting contrast intra-arterially through a guide catheter positioned within the RCCA (Fig 1C, -D) by using a hybrid DSA-CT suite (Somatom Sensation scanner; Siemens, Malvern, Pennsylvania). Four needles were placed into the tumor under CT guidance from a subzygomatic and transnasal approach (Fig 1E). Initial angiogram demonstrates a large hypervascular lesion measuring 5 × 5 × 4 cm with arterial supply from feeders originating from the ECA and ICAs (Fig 1F, -G). Unsubstracted images after the injection of 12 mL of Onyx show the complete uniform Onyx cast within the tumor bed (Fig 1H, -I). Postembolization ECA and ICA angiograms show no filling of the hypervascular tumor (Fig 1J–L). A and B, Axial CT images show a large JNA (arrowheads) within the infratemporal fossa, maxillary sinus, and nasal cavity, extending intracranially. C and D, Intra-arterial CTA; MIP image (C) and surface rendering display (D) show the large JNA (small arrow) with supply off the ECA and ICA. E, Axial CT image placement of needles into the mass from an infrazygomatic approach. F and G, AP (F) and lateral (G) ECA angiogram showing the hypervascularity of the JNA (small arrow). H and I, AP (H) and lateral (I) unsubtracted images show the Onyx cast in the tumor bed. J and K, AP (J) and lateral (K) ECA angiograms immediately after embolization, showing that the tumor is devascularized. L, Lateral ICA angiogram shows no arterial feeders supplying the tumor. A 48-year-old man presented with a left CBT located at the extracranial carotid bifurcation (Fig 2 A). An angiogram demonstrated a highly vascular lesion measuring 3 × 3 × 4.5 cm splaying the carotid bifurcation with arterial supply from feeders originating from the ECA and ICA (Fig 2B, -C). The tumor was punctured percutaneously under fluoroscopic guidance with a 20-gauge needle, and a parenchymogram was obtained (Fig 2D). A total of 4.5 mL of Onyx was injected into the tumor. Immediately after embolization, the tumor was devascularized (Fig 2E, -F). The unsubtracted images show the Onyx cast within the tumor bed (Fig 2G, -H). A, Lateral CT shows a carotid paraganglioma (small arrow) splaying the carotid bifurcation. B and C, AP (B) and lateral (C) LCCA angiogram show a carotid paraganglioma (arrowheads). D, AP parenchymogram showing filling of the tumor. E and F, AP (E) and lateral (F) LCCA angiogram immediately after embolization, showing that the tumor is devascularized. G and H, AP (G) and lateral (H) unsubstracted images show the Onyx cast in the tumor bed. Nine paragangliomas and 6 JNAs were treated in this series. There were 11 males and 3 females with a mean age of 33.4 years and a range of 11–56 years. Embolization was performed in preparation before surgery in all tumors, with surgical resection performed 24–48 hours after the embolization. A combination of endovascular embolization with particulate material and DPE was utilized in 14 out of 15 cases. DPE was used exclusively in 1 paraganglioma in which the arterial pedicles to the lesion were too small to catheterize with a conventional microcatheter. Onyx 18 (6% EVOH) or Onyx 34 (8% EVOH) was utilized in all cases. Of the 15 tumors treated with DPE (with or without particulate embolization), 87% (n = 13) of the cases had near total devascularization, while 13% (n = 2) had subtotal devascularization (Table). There were no tumors in which <80% of the lesion was devascularized. One paraganglioma treated exclusively with the DPE technique utilizing EVOH had near total devascularization of the lesion with an intraoperative blood loss of <50 mL at resection. The effectiveness of preoperative devascularization of the lesions by all surgeons was graded as excellent in all patients subjected to surgical resection. The mean intraoperative blood loss was 780 mL (range, <50–2200 mL) (Table). In 6 of the last resected lesions intraoperative blood loss was 100 mL or less. A change in surgical approach was taken after DPE of a large JNA injected with 5 mL of EVOH. This tumor was removed from a transnasal endoscopic approach with <150 mL of blood loss at the time of resection. The operating surgeons reported encountering minimal or no bleeding from the tumor bed, which greatly improved resection time, intraoperative blood loss, and visualization of the lesion margins. DPE of EVOH into the tumor was particularly helpful at demarcating the pathologic margins due to the mixture containing tantalum, which stains the tumor. There were no major or minor clinical complications from the DPE technique. No patient experienced nontarget embolization or inadvertent reflux into the intracranial circulation of the liquid embolic agent. Surgical removal of hypervascular lesions of the head and neck is often associated with significant intraoperative bleeding because of the hypervascular nature of these lesions, especially when they are large. To reduce intraoperative blood loss and possibly surgical morbidity, endovascular techniques have become an important tool for the operating surgeon. A percutaneous approach by using liquid embolic material such as cyanoacrylate glue has been shown to be safe and effective in obliterating the vasculature in a number of different hypervascular head and neck lesions. Chaloupka et al14 performed percutaneous injection of a cyanoacrylate mixture in 24 cases achieving either total or near-total devascularization in 83% of the cases with no serious complications. Abud et al15 demonstrated that DPE could be performed in head and neck paragangliomas utilizing modified acrylic glue with a high degree of effectiveness, technical success, and a low rate of complications. However, there have also been reports of migration of glue into the middle cerebral and ophthalmic arteries along with even delayed migration into the intracranial circulation 12 hours after the embolization.16,17 Extreme caution must be utilized in supplying feeders arising from the intracranial circulation and potentially dangerous ECA/ICA and ECA/VA anastomoses to prevent unwanted glue migration. Quadros et al5 reported a single case of a cervicodorsal paraganglioma treated by direct percutaneous injection of Onyx and endovascular delivery of particles. Recently, Elhammady et al6 reported a single case of DPE of a CBT with Onyx. Wanke et al18 also recently reported 4 patients treated for 6 carotid paragangliomas in which complete obliteration of the lesion was achieved with DPE of EVOH as the sole embolic agent. This was combined with endovascular microballoon protection of the ICA. We report our experience with 15 hypervascular tumors of the head and neck during the last 2 years that were treated by a combination of endovascular particulate and DPE utilizing EVOH. Our series to date is the largest utilizing DPE of EVOH to treat hypervascular head and neck tumors. We think that the material characteristics of EVOH allow for a more controlled and complete devascularization of hypervascular lesions of the head and neck when compared with conventional liquid embolic materials, such as n-BCA. Onyx is a relatively new liquid embolic agent consisting of EVOH dissolved in various concentrations of DMSO with a micronized tantalum powder added for radiopacity. When this mixture contacts aqueous media such as blood, DMSO rapidly diffuses from the mixture, causing in situ precipitation of the polymer without adhesion to the vascular wall. The polymer precipitates initially within the peripheral portion of the blood vessel, with the central portion remaining in a liquid state. This may allow a longer more controlled injection with better penetration of the vascular bed when compared with conventional liquid agents, which polymerize immediately on contact with blood. Additionally, the characteristics of the material allow the operator to stop the injection within the lesion if the EVOH starts to enter an arterial pedicle, a venous outflow vessel, or dangerous ECA/ICA or ECA/VA anastomosis. The injection can then be restarted after this portion of the lesion has solidified. The EVOH will then find the path of least resistance, filling another portion of the lesion. With other liquid agents this is not possible. Furthermore, these characteristics may allow for treatment of large tumors from a single needle position, thus decreasing local access site complications. Another technical advantage of Onyx is the possibility of performing angiography during the embolization, which enables assessment of the need for additional embolic material and to visualize possible filling of dangerous ECA/ICA collaterals, arterial pedicles, or venous outflow vessels. Nearly all of the tumors were initially treated with particulate embolization; however, complete devascularization could not be achieved in most cases. Of note, lesions shown to be completely devascularized on angiography after particulate embolization still showed a vascular blush with filling of the surrounding small arterial supply on the initial parenchymogram. We found EVOH easier to use than n-BCA. The short polymerization time of n-BCA limits the amount of material that can be injected into the lesion, thus requiring placement of multiple needles to completely fill the lesion. In contrast, with the longer polymerization time of EVOH we were able to inject the material over a longer timeframe in a more controlled manner, thereby achieving a more complete uniform filling of the tumor. This may require fewer needle placements, thus possibly decreasing the risk of local complications from needle placement. Once we became comfortable with the use of EVOH we were able to inject a large amount of the liquid embolic agent into the lesions, which achieved complete devascularization in nearly all cases. We routinely do not inflate a microballoon in the proximal ICA, as Wanke et al18 showed in their initial series of 6 CBTs treated by DPE with EVOH. We thought that the balloon may increase the complexity of the case and subject the patient to the possibility of additional risk. Given that some of our injections were performed during several minutes, sustained inflation of the balloon over long periods of time would have been required in the ICA, thereby subjecting the patients to additional risks of dissection or thromboembolic events. Given the lava-like flow and very slow controlled injection rate of EVOH, we thought that this was unnecessary. We were initially very conservative with the amount of EVOH injected into the tumor; however, after becoming comfortable with the percutaneous technique, we became more aggressive with the amount of EVOH injected, and in the last few lesions we were able to inject as much as 12 mL into a lesion, thereby achieving complete devascularization of the capillary bed of the tumor and small arteries surrounding the lesion. This is best reflected in the last 6 cases performed, which all had 100 mL or less of blood loss at the time of surgical resection. Major blood loss during the surgical resection of 4 large JNAs extending intracranially was attributed to the extensive surgical exposure needed to resect the tumor and not from inadequate preoperative devascularization of the tumor. Several major centers routinely do not perform surgical resection of these large JNAs due the morbidity and mortality related to treatment, but will offer radiation as an alternative. There are several limitations in our study. The relatively small number of patients makes generalization to a larger cohort of similar patients very difficult. Nearly all tumors were embolized with a combination of particles and DPE, and thus the surgical handling properties and blood loss encountered during resection are a reflection of the combined use of both embolic agents. A conclusion cannot be drawn on which embolic agent was more effective. A direct comparison with n-BCA was not made with EVOH. Thus, no conclusions can be drawn about which liquid agent may be more effective for DPE. In this small study, the use of percutaneously injected EVOH in conjunction with standard endovascular embolization techniques in patients with hypervascular head and neck tumors seemed to enhance the ability to devascularize these lesions before operative removal. EVOH seems to be safe when utilized during DPE for hypervascular tumors of the head and neck given its lava-like flow pattern, controlled slow injection characteristics, and its more uniform complete lesion penetration. Further studies are necessary to prove its superiority over other liquid embolic agents or other embolic material. In our preliminary series, the use of DPE of EVOH provides controlled, safe, and effective tumor embolization. Paper previously presented at: Annual Meeting of the American Society of Neuroradiology, May 16–21, 2009, Vancouver, Canada.